I have been writing about food in Argentina for the last 6 weeks and yet if someone asked me to describe it? The problem is the first night I arrived in Buenos Aires I went to Cafe San Juan and didn’t know that it was a famous restaurant or was considered to be one of the best in the city. Maybe it’s because I have spent all my time in Buenos Aires. The first night I had an amazing meal and was so excited to be in the city. Afterall with its Italian heritage it must be a haven for foodies, right? I don’t know what happened when the Italians came over but they forgot to bring the Nonas because the best food here is international. I have already told you about alfajores, locro, empanadas and steak, here are some other things Argentines love to eat. Better known as black pudding to the British and Irish, I had never heard of it before South America. Morcilla is a blood sausage which means it is made from pig’s blood and ground up pieces of pork or offal mixed in with spices. Those who can get beyond the idea of eating a sausage of blood sometimes have a problem with the texture because it can be a bit moist. At Siga la Vaca Jorge reminded me that in Colombia it also has rice in it which helps dry it out. He suggested eating it on a piece of bread which does really help the texture issue. But texture and blood aside, it really is delicious. Croissants are very typical at breakfast with coffee. People say the ones made with lard are better than with butter but I haven’t found a single one I would rave about. Worse yet, I have asked around and no one else really praises them. They may be a tradition but not one worth keeping. Simply said, chorizo on bread with a bit of chimichurri sauce. It’s pretty simple but delicious. 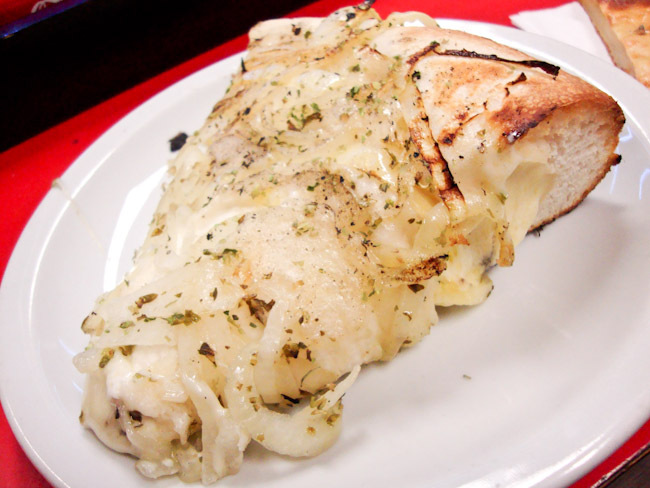 While Argentine pizza, derives from Neapolitan cuisine, the Argentine fugaza/fugazza comes from the focaccia (Genoan). You can get fugazza in Argentina but what interested me more was the fugazetta which is essentially the fugazza stuffed with cheese, it is the ultimate stuffed crust pizza, it’s not only in the crust but underneath the pizza toppings. Don’t try to eat more than one slice. Typical Argentinean pizza has an inch-thick crust and more cheese than anyone could possibly need. But unless you have a crazy hangover it’s awful pizza. However, thin crust, or pizza a la piedra, is becoming more popular. If steak is starting to bore you, there’s always the option for variety with breaded and deep fried steak. Milanesa is also available in other meat forms along with toppings such as tomato sauce, cheese and egg. Personally I prefer it in a sandwich. A sweet paste, dulce de leche is a national obsession. Used to fill cakes and pancakes, spread over toasted bread for breakfast or as an ice cream flavour it is one of the few things people eat that is considered a gaucho cuisine. Any Argentina travel guide will profess the quality of steak in Argentina. A lomito is a sirloin steak sandwich, I had my first in Salta. I prefer to remove the egg but otherwise it’s one of the cheapest most delicious things in Argentina. Overall in Argentina food here is…well…okay…but it will never compete with Peru or Mexico. Morcilla? That’s spanish, and one of my favorite tapas. If not on bread, its great to have it in a pan with “pimientos del padron”. I had to laugh when I read about the choripan! My boss always jokes about it, saying its how some politicians get their votes in the country – by giving out free choripan for every vote. Dulce de leche is adictive. When the summer is over, I want to learn how to do it myself! I think it’s pretty easy to make, I remember years ago seeing a video where you could just boil a can of condensed milk. Yep, covered with water for 2 hours. But you can buy a better version at any Latin Market. It is addictive, but to me tastes better in country. At least the red wine was tasty. Have not been in Argentina for many years, fell so in love with the country. But you might have a point with the food. I remember eating chivo, goat which is often splayed in front of a fire for hours and it was tough. It was explained to me that it is the Argentine way to eat it drowned in Chiante. It did help. But tea time and dulce de leche tostadas, wonderful. A hotel in el Chaco served me a gigantic Milanese in the shape of the country. In my hometown too, Sardinia, we have the blood thing, just we don’t eat it very often, only on special occasion, and personally I don’t like it, I find it too sweet..
I’d agree it’s not an every day kind of food, well at least it shouldn’t be. You missed Provoletta (backed wheels of provolone). If you get Provoletta Completa, it comes topped with grilled onion and herbs. Absolutely delicious! Fugazetta is one of our favorite foods in the world. I did eat it and it was good but perhaps at that point I was jaded, I have eaten a lot of delicious cheese dishes and it was good but not memorable. If travelling to Argentina isn’t a mouthwatering prospect enough some of this food certainly is! this post made me hungry… the Fugazetta overloaded with cheese looks dinfully yummy! It’s a brick in your stomach but good to try once. LOVE Morcilla. Too bad you can’t get it everywhere in the States. Yup – totally agree. We said it in our post about the things that surprised us about Argentina and I’ll stand by that, even though a couple of people weren’t impressed with it. Argentine food, aside from meats, is nothing to rave about. We had amazing Italian food in Cuzco and not a single nice Italian meal in the whole of Argie. Peruvians just have a better sense of food being light and flavourful whereas Argentines think a load of cheese or sauce is the way to go. I’m afraid I’m one of those people who wouldn’t be tempted by the morcilla. But some of the other dishes look good. I’ve heard a lot about the confiterias of BA — their desserts always look wonderful in pics. I was already hungry when I saw this! Now I’m just struggling and weak from food lust. I was a real lover of the choripan, wrapped in a piece of bread and doused with chimchurri sauce. Chimichurri sauce rescues a lot of food there from its innate blandness. So you haven’t tasted a full home parrillada,, it usually comes with chorizos, chinchulines, morcilla, mollejas, tira de asado, papas a la brasa, zuchini a la parrilla, provoletas, ajos y cebollas a la brasa, plus the salads. Or lamb slowly made a la cruz. I think you didn’t go to the right places, because the melting pot that Argentina is, is expressed in the variety of it’s kitchen. Oh believe me Argentinian food is amazing! I’d prepare some myself for you to try . Bland? No way ! You are the only person I have ever heard say that! I don’t think I’d eat blood sausage from anywhere. The texture would probably get me. Although I did have a ravioli appetizer in Germany filled with a type of blood sausage. I did try it because it was very small and remember it being good. If you can get beyond the texture it is really quite tasty. Seeing that I could probably live on red meat and red wine, I still think I’d do okay in Argentina. Interesting, though, to learn that the rest is so average. Thanks. Besides mexican food, I could live on Croissants… delicious! I haven’t had a decent croissant here, it’s shameful. I didn’t know that the black pudding is called Morcilla 😀 Aside from the pizzas you mentioned, all the rest are common in other countries. Common in other countries and much tastier too. I lived in Mendoza for a year where the food is even more limited than in BA. I can’t agree more that you have to wonder what happened to the Italian heritage when it comes to the cuisine in Argentina. I have been cooking nearly every day to try to combat the heaviness of the food. Yeah, I lived in BsAs for 3 years and the food is pretty rotten. Everyone holidays in Argentina and goes home raving about how great the food is but that’s because all they eat is steak and empanadas for 2 weeks and they’re pretty much the only 2 things they do well (very, very well). Italian food in Argentina is beyond rancid, the pasta is awful quality and then they slather it in a variety of god-awful sauces that invariably have half a kilo of the cheapest ham known to man chopped up in it. And maybe some canned spinach just for good measure. I had better pizza at the Iraqi run takeaway near my university in Leeds than I ever had in Argentina. And Locro…best described as a big bowl of bile. But I do miss the steak. And there are many other non-food related awesome things about Argentina, of course. Oh, I also agree about the medialunas, but there are a couple of places where you can get amazing ones. The first is on the corner of Avenido de Mayo and Parana, just off Plaza Congreso (I lived next to the place). Gooey and fatty goodness (the manteca ones, that is). The other is somewhere in the Microcentro. Can’t remember where, I think close to Reconquista and Florida. I do love the empanadas but they cannot make up for all the other mediocre food, although you could never say that to a Porteno. And what is it that the Argentines have against ginger? Wander round any supermarket in Patagonia and half of it is either booze or soft drinks. But the only mixer you can buy is tonic. I’m sitting here in Villa la Angostura sipping a rum and coke because nowhere but nowhere can you get a Canada dry. My Argentine friend bought a load of dry ginger in Chile, but can he get anyone in the family to try it? No dice. These guys can’t create good food, because they have limited taste experience. They’re only using about 50% of their gustatory perception. So, don’t trust an Argentine on anything related to gastronomy. Wow… U guys really don’t know where to go eat in Argentina and definitely don’t know what to ask for… Btw, u can find ginger in every “verduleria”. Argentinian don’t sell Canada Dry as US/Canada probably don’t sell common drinks from Argentina. It’s a shame that you think that all the drinks from all over the world should be in each country. If you love Canada Dry so much, bring it with you on your travels as argentines do with the “mate”. Btw, there’s ginger everywhere in Argentina but you didn’t know where to look for it. Don’t blame argentines because of your ignorance. Mmm, the morcilla does look like black pudding in Ireland. SO good on some brown bread or with a salad. Argentine food looks so heavy. How do you eat all that and red wine when it’s hot out? I would feel so sick and sluggish. It’s fall right now so the heavy foods seem fitting but in the heat it would be terrible. Have to agree with you. Steak is great but the rest of the things highlighted don’t look that great. I’m sure they are good but on a global scale, meh. It was a struggle to find things to mention that were decent. Totally agree. The disappointing thing in Buenos Aires is that the food that is delicious is usually very bad for you… breaded steak, pizza, choripan. Or it’s at a nice (aka expensive) restaurant serving international cuisine. I am hoping for better and more traditional foods when I get to the other parts of Argentina. So true. Choripan is tasty but you can’t eat it every day. Oh gosh, I’m always in heaven eating in BsAs! Such a shame you’re not digging the cuisine. I just find most of the great places are international and not traditional cuisine. I’m surprised. I thought you loved the steak. How’s the wine, at least? The steak is great but you can only eat so much of it. The wine is good although I’m not a huge fan of malbec and prefer wine in Chile. You know I didn’t write about Colombian food because I struggled with the same issues – rather heavy and not a lot of flavour. So, for a non-steak eater, sounds like a holiday in BA would revolve around wine, huh? Doesn’t sound toooooo bad. Are there health retreats for afterwards? We have two varieties of morcilla, savory and sweet! The sweet one is mixed with almonds and currants, and tastes nothing like the Black Puddings I remember from Lancashire in England. I love Argentinian meats, and the cakes are heaven, and the rest is, yes, a bit like fast food stuff, really. Although I think most countries have their specialities and the rest is also-ran, with a couple of exceptions! I’m not much of a sweets person but the bakeries do have amazing looking pastries. Also surprised here-“meh” is not what I would have gathered from previous posts! I know I felt that I was misrepresenting the cuisine because I talked about the steak so much but overall its not a foodie haven. I am surprised that the food in Argentina isn’t better – perhaps because it is not as common here in the U.S., I always had this vision that it would be more interesting than Mexican food. You would think with its Italian heritage it would be amazing but it’s really the biggest letdown. I completely agree with you. We spent two months in Buenos Aires (and four in the country) and found the food to be OK, but not particularly WOW (like Peru) and rather repetitive. When we wrote this, it was really interesting to see the reactions from some people. Almost got in an online fight with a rather established food/travel writer/bloggers and some Argentines living abroad claimed that our “American tastebuds” were to blame. But, I agree with you – Peru (esp. Lima) is where it’s at when it comes to food in South America. Agreed! There is a bunch of things the Argies do awesomely, especially ASADO mmmmm. But variety is totally lacking. Viva Peru!!! Well, sounds like you’ve found the dismal food scene that I described a month ago. Now you see why I eat in Chinatown and the Peruvian joints. I’ll call it what it is; ghastly. One thing that I would offer is that the food scene is really representative of the Argentine mindset. That it to say, it is all about making the scene, being in the right barrio, with the right people. These people are among the most insecure I have met in all my travels. Ever wonder about all these swank, cool spaces all around Palermo, Belgrano, Recoleta, Canitas? They all serve lousy food that is big on show and delivers little quality. A pity, as the country is blessed with an abundance of great ag land that could/should produce great products. Hands down – the most popular restaurant in the country is a place called “Kansas”, with a couple locations – the most popular being next to the Hippodrome in Palermo. There is a line of cars waiting to park on most nights. Basically a knock-off of an American upscale chain. Go figure…. It’s interesting to see that Peruvian food is the up and coming thing on the food scene. But agreed that I have eaten a lot of mediocre but pricey food. To clarify some points, kansas is not the best restaurant of argentina, as you caled it, you should notice just from tjhe building the copycat of aa american style restaurant. Well just wanted to clear that point, If you are looking for the best restaurants, in Buenos aires, you have to go to Puerto Madero. Byu the way, i said buenos aires, not argentina…. I think that was the point the commenter was trying to make, that unfortunately one of the most popular chains is a copycat. There are definitely great restaurants in Puerto Madero, as well as San Telmo and Palermo. The food here really is lame. All my favourite places are foreign restaurants. The ice cream, however, is to die for. Well you are the ice cream critic! In moderation all this food is awesome. Looks delicious. I know you said the food was “meh” and all but your photos are making me drool all over my keyboard. Maybe you could just take a picture of a trash can instead? Then I won’t have to clean up all the slobber that has covered my computer. Ha thanks! I had written so much about the steak I thought I should let everyone know the rest of the food is really not that good. The wine just takes away from the sting that the food is bland and boring. Here are some places I liked in BsAs. Cumana for wood oven-fired empanadas 9the most wonderful I’ve had in the city). La Panaderia de Pablo on Defensa (San Telmo) for a fresh, modern take on pastries and they have a wonderful fugazetta. I’ve also written (and photographed) about this “place with no name” on Defensa. A pay-per-kilo cafeteria-style take out place that’s cheap – and they make wonderful spinach fritters and arroz con pollo. 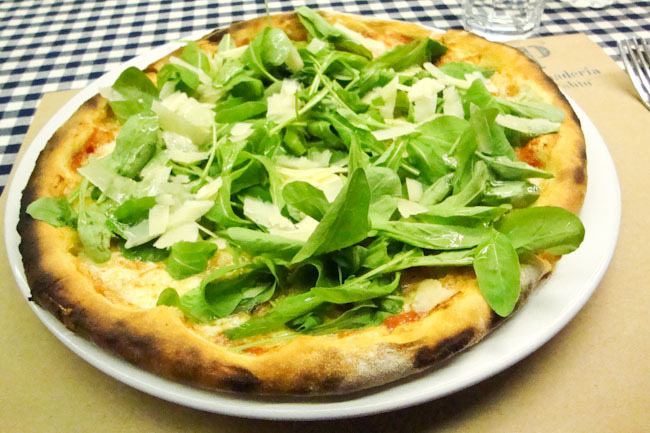 I went to La Panaderia de Pablo and had the arugula pizza as recommended by a friend and it was delicious. Huh. Like you, I would have thought it to be marvelous! Mabe everything looks better than it tastes. That’s sad. If you want some spiciness go to Peru, the food is delicious. Oh yeah none of it is healthy, I have gained 5 lbs and I call it my steak weight. The food in Peru and Mexico has more color to it as well (mainly because of all the vegetables they use). Did you find that Peruvian food has a strong Asian influence? I’m not a big meat eater, and though Spain is big on their jamón, there are also a lot of veggie and other options, thankfully. There is a large Chinese population so you do see a lot of chifa, but Peru seems to be experimenting with the cuisine a lot now and you can see Japanese influences as well. I think Peru is the most innovative in South America whereas Argentina continues to serve pizza with crust that is two inches thick and has too much cheese. How about the upscale places in Argentina? One of the appeals to me is that international and continental cuisine is half the price in the U.S.
How about the French, Continental type places? I’ve been looking to splurge on some restaurants and figured i’d get more bang for the buck in Argentina? Prices in Buenos Aires are so interesting because if you want fine dining you can really get some great food for much less than you would pay in North America. Say it isn’t so! I was actually looking forward to eating in Argentina. Well, maybe I was really craving the beef more than anything. Interesting though, that the food in your photos seemed very appetizing. I’ll keep my expectations down, so I won’t be too disappointed once I get to Argentina. That is a bit disappointing to hear, but I do have to say that Peruvian food is a really good example of some delicious edibles when cultures mix. It’s tough to say Argentine food is great when Peruvian food is so amazing. Wow, that’s surprising. But at least you’re honest and know what you like and don’t buy into the whole ‘Buenos Aires is the Paris of Latin America therefore it has the best of everything’ mentality. Yeah the whole Paris of Latin America thing is ONLY because they are the only city that uses European architecture. If anything Cartagena is much prettier than BA which is decaying. I felt the same way when I was in Argentina a few years back. Maybe the key thing is that Argentinian food isn’t that interesting for a vegetarian backpacker. Anyway it wasn’t bad, it just wasn’t the culinary mecca I’d built it up to be. Actually enjoyed the food in Uruguay more because it was cheaper and we could afford to eat better. I think it wouldn’t have been so disappointing if people didn’t rave about it. The expectations were too high. Hey do you know the trends about food and beverages coming to Argentina? I need it for a schoolpaper. What is everybody lately been drinking and eating? Well I have been there the past 6 weeks you should find some information in this post on the popular food. I’ve been raving like hell to people here about Peruvian cuisine. I’ll be heading over to Peru for a third time in October, and then heading off to Buenos Aires for the first time. Am I going to be mighty disappointed? Maybe I’ll have low expectations so the food will taste better! I feel a certain relief on reading that I’m not the only person that thinks BsAs food is not sooo great as many people think. Since I spend some months year, I could understand why:lack of ingredients. There is no variety! And lack of good ingredients as well. But luckily I’ve found some nice places, so I can live a little bit happier. Man we had some amazing food in Argentina. We ended up writing a book on food from around the world , with Argentina included. De nada. But I think you may be over reacting considering it is my evaluation about food not your country, and I stand by it. All the food sounds a little unappealing to me..
Hopefully Pigudo is not representative of the people in his country. Most likely he’s just a teenager who’s discovered internet courage. Eres un pobre diablo argie, no te gusta la verdad pues aguántate marica. I am so sorry but this idiot needed some response for his offenses . Que te calles cabrón. No escribes estos comentarios maleducados aquí. Ella no esta criticando la argentina sino la reputación mundial de la comida. Es una cosa no estar de acuerdo con una opinión y otra dejar un comentario así tan feo. I think this post is really great. Travel blogging needs to be more open and honest about people’s opinions of places. Isn’t that why people read blogs? If you want non opinionated answers to a destination, go to Wikipedia. And about vegetables, we do eat them every day. I think you just dont saw the whole picture. Thank you for leaving a thoughtful comment and I only spent 2 months in Buenos Aires so I am definitely not an expert, you are right it is just my view of my time there. To be fair, while I think the cuisine overall is better in Peru I agree that pasta is probably not great there and would be more likely to eat it in Argentina. I will say, you do have great gelato. I really did enjoy that in Buenos Aires. you`r welcome, yes gelato is like heaven, Ive ate handmade gelato in Cordoba, the best one Ive tried in my life. Maybe not, I’m sure we have differences of opinions, and I am Canadian. I loved the choripan, more so the places that sold them. They had their own unique charm including the owners and customers. Very good that you’re honest. It’s good to know that are writers that are not afraid of critizing the food. But in Argentina you can never go wrong with Bife de chorizo or bife de lomo with chimy churry! I agree that the food in Buenos Aires is horrible, excluding the excellent grilled beef, the morcilla, and the ice-cream. There is one other thing they do well: chips (i.e. French fries) – these tend to be fried in beef tallow and go very well with a delicious steak. I was not impressed by the empanadas or the medialunas and don’t particularly like dulce de leche. I have to agree about the revolting pizzas and dreadful pasta – although the ubiquitous fresh pasta shops where you buy pasta and cook it yourself are good and inexpensive (I haven’t been to Italy and so can’t compare them with what they have there). The coffee is almost always horrific, but there is a little place in Palermo (on the corner of Nicaragua and Thames, if memory serves) called Latente – the coffee there is exceptional, comparable with what you might find in New Zealand or Australia. I lived in Buenos Aires for seven months and have been to Mendoza as well; in general, I found the food in Argentina bland and depressing. Once I discovered a small Peruvian place near my house my problems were solved: I started eating there every day and was always more than satisfied (with the value for money as well as the delicious food and friendly service). The problem with Argentinean cuisine is its remarkable lack of diversity. ; there is nothing wrong with the raw ingredients available there – but the crucial one is missing: imagination. There is also a lamentable inability to accept much in the way of flavorsome foreign influences; there are so many Peruvians in the city who take cooking seriously and know what they are doing – but, alas, the Porteños tend not to have much respect for the Andean immigrants living among them. The food in Argentina is amazing but its not amazing everywhere. And its heavy, I give you that. You need to know where to go besides the common restaurants, where all the turist go. Siga La Vaca…..horrible place to eat. You need to know where the good food is, but if you find it, its great. There are amazing Italian restaurants, but the best pasta… is cooked at home by our grandmas. You cant even compare it to Mexican food. Basically , if know where to go, for the same price you get McDonalds in the US you get steak or pasta. And its around the corner and everywhere. Next time you need to have some locals take you around. Argentina, in my experience may represent the lie to the adage that ‘You can’t have too much of a good thing’. Argentina has a superabundance of beef the associated protein of cheese. Historically England had the same. Until only recently European visitors would level the same criticisms of English food that they aim at the Argentine. Necessity is the mother of invention and countries with less abundance of raw material often do better in terms of innovation. There can be no excuse however for the appalling quality of Argentine bread. It is mostly inedible. someone who thinks that bacon is magic is not a parameter for me. As an argentine living in Buenos Aires, I accept that our taste is quite childish. we are intolerant to spicy food, for us, pepper, even mint, is hot. But I do think that your research, or at least the places you talk about, is superficial. There are so many restaurants, bodegones, fondas in Buenos Aires! But you have to get away from the tourist route. Palermo, San Telmo, Cañitas, Puerto Madero, they are towns that live from and for tourism, so they adapt their cooks to an ”international palate” (that´s to say, standard stupidness.) It´s a pitty that tourists aren´t encouraged to go to different, outlying towns where is more possible to find real good food experiences. As a visitor in different countries , I have a rule: don´t go where everyone ´s says to. Meat could be a course for gastronomic development in Argentina, for the simplest way to cook is to put it in a parrilla and wait. But we have wine, ice cream, olives. Amen. You make a really good point. To understand the food of a country you can’t simply eat in its capital city and judge what it is like everywhere. My experience there was underwhelming but perhaps the next time I come back I will take your advice and get out of the city. It’s a shame that Argentines are missing out on some of the great flavours of the world. If restaurants on the tourist circuit actually served good and varied food they would do good business although I suspect that they would have trouble sourcing good vegetables etc. International visitors would relish decent food. The chances are that people (at least from Europe) making it as far as Argentina is likely to have reasonably sophisticated tastes. For goodness sake at least learn how to bake interesting bread!!! I have to disagree. I feel as though you’re only eating the equivalent of “fast food” items. It’s like traveling to the states and only commenting on hot dogs, hamburgers, and french fries as the “traditional” cuisine. Since I’ve been in Argentina (Buenos Aires) I’ve had some of the most inventive, amazing meals of my life…not loaded down with butter, preservatives, processed items, sugars and sauces. It just takes a bit of looking into. Many restaurants are using local, fresh ingredients. Also, as far as wine goes…many many more wines to try here besides Malbec. I’ve found lovely Pinot Noir, Carmenere, Cabernet Franc and killer white wines (check out the brothers Michelini, their wines are incredible). Again, you seem to reference the Porteño menu of empanadas and loaded down pizzas. There’s a very “italian” pizza place located in Palermo specialising in thin crust, minimally cheese’d pies and it’s divine. Any country has their “snack” foods, which even the residents don’t indulge in often. I actually feel like when I go back the US I can’t get my hands on as fresh and tasty of food as I can get here. At some point, anyplace you travel…chances are you’ll do some of your own cooking just because it’s more economical than eating out every meal. Croissants, I’ve found three panderias that make them fresh and delicious. It just took some digging. But again speaking of the foods you listed above as the traditional cuisine is kind of odd. It’s like going to waffle house and insisting that’s what most American’s eat for breakfast disregarding wholly the fresh options for meals you can get if you simply do some research. Salads- at Pain et Vin (a local lunch and wine joint) I just ordered a quinoa, arugula, fresh cherry tomato salad, lightly dressed with olive oil and extremely fresh and amazing. A great blog I reference when wanting to hunt out the fresh, local and delectable cuisine is: Pickupthefork (dot) com. She’s a great writer who seems to have located all the amazing food establishments in Buenos Aires( run by locals who like to source and provide the freshest Argentine ingredients). One stop shop. Because, as in any other country even the local fare you think you know can be reinvented, cooked fresh from locally sourced joints and taste wholly different than the choripan you picked up from the street cart. I’m not sure if you are disagreeing with me or the OP, but I definitely wasn’t trying to eat at fast food places. I only spent 2 days in Buenos, but 3 weeks in the lakes (Bariloche, San Martin etc) However my main gripe is with shops. So where do you go to find a variety of Breads, e.g. Integral, Rye, etc. And why is every supermarket almost dedicated to fizzy drink, but you can’t find a bottle or can of dry ginger. And where is a decent granola or a range of spices – I could go on? Living on a continent that can grow the most amazing fruit and veg why can’t Argentina get even within a sniff of the variety of Peru or Bolivia for example. The answer has to be that there is no market for interesting tastes and that is a national failure of imagination and curiosity. The restaurants are few and far between that have any idea what to do with what we in Europe regard as the cheaper cuts of meat. No it all gets thrown on the Parilla and if it’s tough too bad. Yes you will find exceptions, but the OP and I are talking about national trends; the overall picture. You can’t really mount a defence from the exceptions to the rule. Classic article – love your honesty! Wait till you get to Colombia though – the food is even worse! Haha I have been there and just didn’t write about the food. The juice is amazing but so much fried food! I didn’t only eat pizza – I don’t really eat pizza – it’s hardly ever surprising. But then I liked Mexican and Peruvian cuisine as well. You all stupids i am Argentino and when i travel to NY (very often) i know what to expect with the gross, grill, deli , over priced steak houses, ugly ice cream(italian gelato haha my balls!!) pizza isn’t great it is just ok( 10 pounds of oily cheese on top yeha right real pizza my balls again!! )but it is what it is i am not creating a blog for talk about how prosses and fake is the food in US ( what happend with the Italianos in usa) ask them they can tell you the truth, anyway you know what No more steak for you!!. Argentina has some of the best food with so many world influences! I can’t say one thing disappointed on the food scene there and I was there for months. I’m not sure where you went but you definitely need to go back and experience more! I dont think you have tried Argentinian food at all. Spending two months in buenos aires doesnt really give you an idea of local food. I’ve spent six months traveling around the country and my first impression was the same you had. but then I considered an argentinian guy’s opinion: buenos aires is crowded with people. Too many people, bad food. so I started to visit smaller places and restaurants. Food was totally better. The best decision ive made in the country. I totally understand your point but its definitely poor. you should visit the south, lovely food, meat with great taste, patagonic lamb its one of my fav, pasta with different fungus and mushrooms, wines are better in mendoza. About the north I recomend tipical meals like empanadas, north cacasserole, and awessome meals like Llama meat! its all about finding the right place and meeting people who can recommend where to eat. That’s a great point, a capital city doesn’t represent the food of a country at all. Also more people does mean more opportunities for bad food. I’m not opposed to go back and check out the smaller areas. A trip to Mendoza wouldn’t be so bad at all. I admit that I don’t have a huge experience of Argentine food – about a month in the country and yes, there is definitely good food to be had. Like the amazing vegetarian cafe in Bariloche. But after visiting it we wondered where they were getting their food, because we couldn’t find anything remotely imaginative in Argentine shops, especially supermarkets. I think that it’s a cultural thing. As a whole I don’t think that Argentines get their taste buds educated. Historically it may be a consequence of lots of verdant land and a low population – why be imaginative? If you don’t have to find out what snails and frogs-legs taste like why bother. My son’s Argentine girl only likes bland food. Won’t touch anything spicy etc. If there isn’t the demand you won’t find imaginative couture. Agreed when I was in Buenos Aires I went to a new taco shop everyone was raving about and was told there are two kind of spicy, regular spicy (which is just a little spicy) and foreigner spicy (which is much more spicy). Most people think for visiting Buenos Aires has seen Argentina gastronomy and that is not true. You have to travel and see and taste before you know. I’m from Còrdoba, and if you taste things all over the country youshall see that the food is memorable in Argentina. Hi, I’m an Argentinean living in Buenos Aires, but I come from a little town. Unfortunately, the food in Buenos Aires, and specially in restaurants at Puerto Madero or Cañitas are not awesome. If you want to eat really REALLY argentinean good food, find some argentinean friends that invite you to eat at their place. That’s were the good food is found. We, the argentineans love hanging around at someone’s house to cook for our friends and family. My mother’s homemade milanesas, and my father’s asados will rock your world! We enjoy more eating at home than going out for food. And, I speak for myself, when I go out I rather eat something that is not “typical”, because it always disappoints me hahaha. I lived in Mexico for 4 years, and at first, I hated the food, we are not used to spicy food, but, then I got used to it and I’m a huge fan of Mexican food. But I would never trade it for my dad’s asados. Sadly, everytime a tourist comes is taken to Siga La Vaca, worst place EVER to have good meat. If you want to eat healthy, there are plenty of places to do so, also. It’s just a matter of a good research and good advisors. If you go to the north in Argentina you will find the best empanadas in the world (salteñas or tucumanas) and made by locals with local fresh products. I’m absolutely ready to give it another try, I know the food of a country must be better than just its biggest city. With all do respect, Miss Ayngelina, but u don’t know what you are talking about, If you are a food critic, you should look for another line of work, I’m a gourmet cook, and dulce de Leche is something that United States is descovering, and if you do a survey you will find out how much us Americans love it!!!!!! Every time I serve it I had no one say they didn’t like it. And I have served allot of people in my lifetime, I had the privilege of meeting allot of people that went to Argentina they all raved about the Argentina cuisine, and I’m not talking of just a few people, I don’t know where you had your meals, with that said, everyone has their opinions but that doesn’t mean they are correct, And for those people who just take your word for it I would recommend trying it themselves before they take the word of some else, for the record I’m not from Argentina, But one thing I know is food, And you are totally wrong in the comments you made. 50% or more in Argentina are Italians or italian decent, if you read your history, so for you to say that argentina doesn’t have italian food is very ignorent. There are lots of Nonnas that imigrated to Argentina my Nonna is one of them, like many others, I hope people are smart enough not to take the word of someone that is obviously very ignorant when it comes to the Argentinas cuisine!!!!! !